The NH Muenchen Airport hotel provides guests with easy access to the airport which is only 2km away and can be reached by a shuttle bus. At the same time, you can relax at Therme Erding, Europe s largest thermal bath complex or catch a soccer game at the Bayern Munich stadium. The journey to Munich s city center takes 45 minutes on the S-Bahn. The 236 rooms at NH Muenchen Airport are designed in classic neutral colors and offer free Wi-Fi for guests. Superior rooms come with lovely views over the nearby parks and free use of the shuttle bus. There are connecting rooms available. Each morning, NH Muenchen Airport serves up a fresh breakfast buffet, which you can enjoy until noon on Sundays. 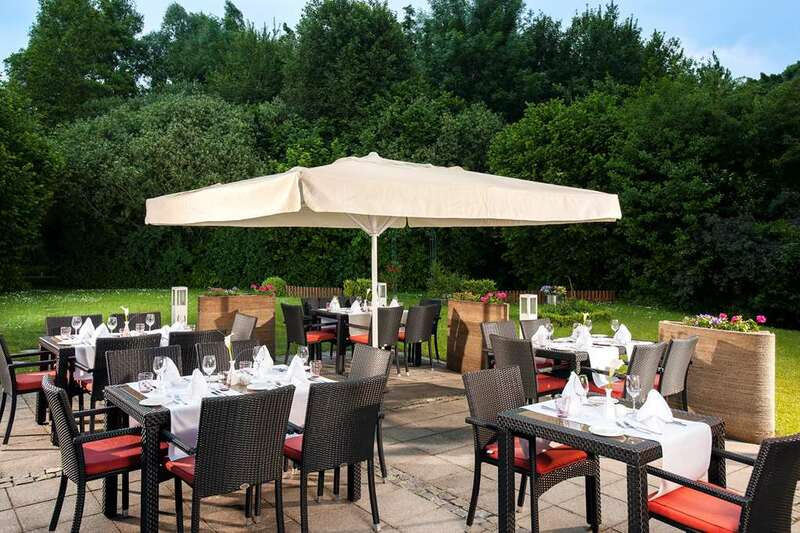 Relax on our terrace and in our garden, where we often organize barbeques featuring grilled Bavarian and international dishes. You can also enjoy an authentic German beer here or at our hotel bar. Gym, sauna and massage services are also available. Additionally, there is a special lounge reserved for airline crew members staying at the hotel. If you are in Munich for business, book one of our 9 meeting rooms that can hold up to 300 people. Located within 2.5 km of the Munich Airport, the NH Muenchen Airport hotel allows travelers transportation to and from Munich with complete ease. Guests can take advantage of the hotel s premium location, close to the attractions of Munich but with convenient airport access. For a small fee, the hotel s shuttle service carries guests between the NH Muenchen Airport hotel and the airport every 30 minutes.